The regular readers amongst you will have noticed that I’d failed to post up my usual Thursday morning (AEST) blog post last week. Well, that was my fault in that I’d forgotten to press my “schedule” button – oops! And I thought I’d managed to post it up on Friday evening too, but apparently the blog gremlins have been playing tricks on me!! Nevermind, here we go – third time lucky! So, yes, today’s post is a really great guest post from the fantastic Australian luthier Lance Litchfield, with a fascinating look into the luthier’s art and the construction of modern high-quality classical guitars. After nearly 25 years as an Australian Luthier I find myself bridging between the most modern schools of guitar building, and the rich heritage of traditional guitar culture from around the world. Over these years I have steered my path mainly on instinct, trying to bring together the best of these worlds. This article is the culmination of some personal views and technical background on what I hear, and my understandings of the make-up of classical guitar sound. I am writing this article as a Luthier, interpreting what I hear with my rudimentary understanding of physics. Although I make some assumptions and hypotheses, they are a framework around which my ear works; I leave the detailed physics to others better qualified than I.
Aesthetics are subjective, right? Well, maybe, to some degree. In the end, the player and audience make up their own minds, but it is also true that individuals are inherently sensitive to particular qualities, while also being capable of learning tolerance for some others. There are also some accepted reasons for why certain sounds are musical, and others white noise, and others harsh instead of smooth and pleasing. These are to do with the nature of consonance, harmonics and what the human ear and brain is able to perceive. There is also the ability for people to learn, and refine their own thinking and hearing – in the classical guitar field much time is spent trying to listen more deeply and gain more from the minutiae; yet sometimes we need to step back and see the forest as well as the trees. Essentially, guitar sound comes from several facets: the strings, soundboard and body, which all work together in unison, as well as each having its own separate contribution. The efficiency of the system and the combinations and characters of these facets create the identity and timbre of the particular instrument. A guitar and its strings have an inherent responsiveness to certain frequencies which are part of their materials, design and construction. The string, when plucked, sets in motion vibrations which consist of the fundamental note, and layers of harmonics and partials, which together form the sound or timbre of the string itself. Second, due to what is called “forced vibration” from the mechanical coupling at the bridge, the sound board becomes a resonator for the strings, enhancing the string output to increase volume, and add its own timbre to the mix. Third is the body’s resonance which via an air and some forced coupling, adds yet more depth and colour and also affects the behaviour of the instrument’s response. The body cavity resonance is also important in timbre, adding depth, openness and output to the guitar, and is also related to the combination of resonances of the body top, back and side plates. It is all of these resonances which, when mixed well, create the beauty and delight in guitar sound. The complexity and richness is analogous to a virgin rainforest with multitudes and layers of species and vegetation, as opposed to a tree plantation. “Multi-string” guitars refer to more than the standard 6 string variety. In part these guitars offer more sympathetic resonances from the strings themselves, especially so with the Yepes style 10 string which was designed for this exact purpose. This in turn has a flow on effect through the different facets, so the guitar will exhibit more sonority than a standard 6 string guitar. Some guitars are evenly balanced, others can have particular strengths, and some can be deficient in certain frequencies. Due to the variations in designs and methods of construction and materials in guitar building, and the different tastes and directions of players and makers, there are a large variety of timbres. For example, sometimes in the push to increase the output and performance traits of the modern instrument, some designs seek to minimise or remove some of the resonances and vibrations, in the attempt to create a more efficient system where energy is focused onto different areas such as volume and sustain; and to also minimise problematic resonances. In doing so, sometimes different resonances may emerge, as well as resonance voids, and so the timbre of the instrument can change substantially to the traditional guitar. In my view, the manner in which the resonances, voids and additions are managed, fall under tonal aesthetics. This is true also for more traditional instruments. Other areas that relate to aesthetics or that manipulate these aesthetics are the performance criteria, such as volume, dynamics, sustain, articulation, attack, decay rate etc. Articulation – there are a couple of factors to consider here, namely clarity and palette. Let’s take my previous analogy of the rainforest , where a diversity of vegetation represents the resonances of the guitar. Imagine a barren landscape void of any vegetation. To plant a tree there, means the tree is highly visible and hard to ignore. The performer may be able to articulate clearly, relying on string fundamentals and harmonics, but ultimately the landscape may be uninspiring to those looking not only at his efforts but the breadth and quality of sound in general. Likewise, resonances set in motion at the lower end of the spectrum (e.g., fundamentals and body cavity resonance) can provide depth to the tone, but may not carry well outside the players earshot, and so the player must be mindful of what the audience will actually perceive. In this way, despite a sense of control over a range of sound, and articulation, an overall impression of nasality, harshness or percussiveness can result over distance as the lower frequencies are lost, especially if there is an over emphasis in very high partial content. Conversely, some proportion of higher partials are needed to avoid a dull, monotonous or bland sound. My view is that a good guitar is able to give the player some discretion over the timing and strength of these various partials, via the guitars resonances and string manipulation, which are the building blocks of the tonal palette. There needs to be a balance and range of audibly pleasing and harsh constituents, such that the prevailing tone is attractive and appealing, yet capable of excursions into the extremes of colour. The skew towards an over dominating timbre must be avoided. Usefully, these days there are many strings available that can help to fine tune these traits to the player’s ear, and to some extent, the audience. The mix of partials within the strings themselves can either complement or detract from the nature of the guitar. A guitar with good harmonic balance may be a more tonally versatile instrument regarding string choice. The sensitivity of the guitar’s response will play a large role in articulation as well. Both lack of, and too much sensitivity can cause difficulties for the player so everything must be taken in balance and on personal report. The sensitivity and richness of a guitar and timing of partials seems to also play a part in tuning. It sounds like a contradiction, but often very fine guitars can be harder to manage in this sense, and so the Luthier needs to use all his skill to optimise his instrument. When tuning my guitars I always prefer to use my ear as tuners rarely make sense of complex partials and their timings. The ear is best at telling you what “sounds” right; especially as tuning between 2 notes is the most relevant and effective way to assess intonation, as opposed to using a tuner for individual notes. Guitars that react and respond easily to player input with a wide range of colours over long sustain can also make control over sound more difficult. A fine guitar may be made to very high tolerances to facilitate ease of playing but on occasion will demand more of the player despite opening new areas of tonality and performance. In my view, a modern guitar approach with a bias for soundboard tonality and sound origin, tends to link more directly the major or prominent resonances and colours with performance traits like dynamics and tonal manipulation. String energy and manipulation from the player more directly and efficiently control these colours originating from the top…the major problem can arise however, when a balance is not struck. If frequency responses of the soundboard are too limited or biased, and the bias of the guitar too much towards the soundboard, the overall sound may lean towards dryness, harshness or hollowness. As the ear is more accustomed to hearing what is audible, rather than what is not, a lot of the time this can be manageable. It appears to me that on some occasions dissonances between the low and high responses in the guitar may form, and an unpleasant ambiance follows. This can manifest as a hollow, echoey, or boxy sound. This effect may to some extent be influenced by how well the guitar tunes and natural irregularities in frequency response for a particular guitar, and the way these interact with the body cavity resonance, and even strings that have poor harmonicity. Conversely, flamenco guitars have a different colour which is almost the opposite in direction, but no less lovely when done well. 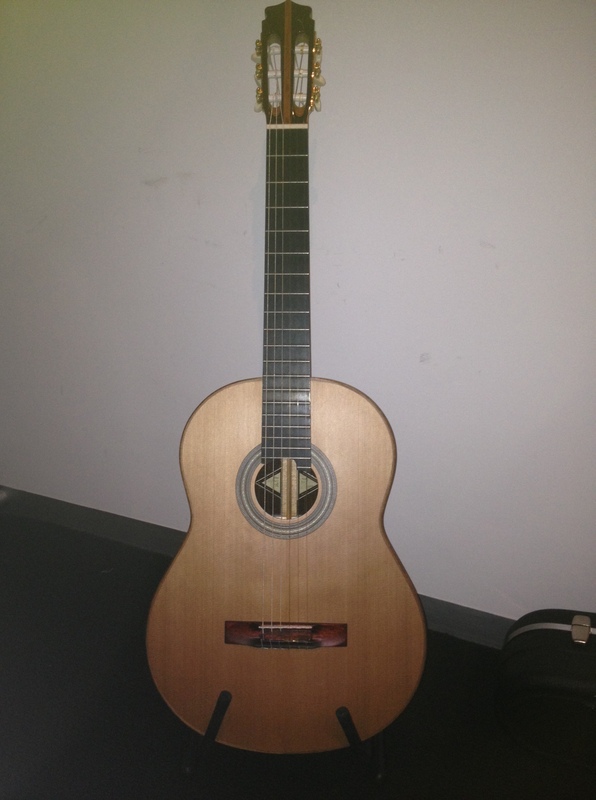 The incredibly light body construction and more robust traditional top serve to limit the sensitivity of the top which favours hard rhythmical playing, while the lighter body resonates well, providing a richness in colour that is perhaps more passive than a sensitive classical guitar, but also does not cloud flamenco music and technique. So far, tone has been talked about in a static fashion, regarding the mix of partials and fundamentals. However, as in music, we play notes in flowing succession, from which there is immediately colour and interest. Imagine an individual note now, with its internal partials phasing in and out in a linear fashion during the sustain, in a similar way. Each note in a classical guitar is like a song in itself. All guitars do this to some extent, as do other instruments (some more than others) and it is the grace of the classical guitar. This natural tendency for static and linear colour and the ability to manipulate colour from direct contact of the strings and plates, and also the communication of this beyond the player, is the mark of a good classical guitar. Regarding static colour and linear colour, natural tone woods have a role to play. In my opinion, the two main tone woods for tops (spruce and cedar) lend themselves to these different notions. Spruce is more focused and linearly modulating, whereas cedar is more evenly/statically tempered with its breadth of partials. Both share each other’s linear and static dispositions to some extent, which can be further manipulated by the Luthier’s designs and methods. Similarly, body timbers will offer character and colour to an instrument, and the Luthier’s input will determine the degree of transparency and control of their contribution. The introduction of new techniques and materials over the past 20-30 years has opened new doors in tonality, and also innovations for performance enhancement. In some circumstances however, modern techniques and materials also open the possibility of removing the natural tonality that is inherent from natural materials used in harmonious ways. Examples of this are structures or designs that minimise the directionality and inherent behaviour of timber (ply construction and dense structures opposing grain direction). It is vital that the Luthier use both new and old options at his discretion to provide balance. Modern methods can sometimes rob an instrument of certain colours while favouring other aspects and a Luthier must control any void content to maintain a solid, rich and balanced character. Conversely, I feel that when used wisely in combination with modern materials and methods, a Luthier also has the opportunity to enhance the behaviour of natural approaches. This is what guitar building has always been about, regardless of how modern its design is or isn’t. Previous postWhat Do I Need To Start Playing Classical Guitar?